JU-CHUN KO — imMatch: Fast Stitching Gestures for Multiple Heterogeneous Multi-touch Surfaces. 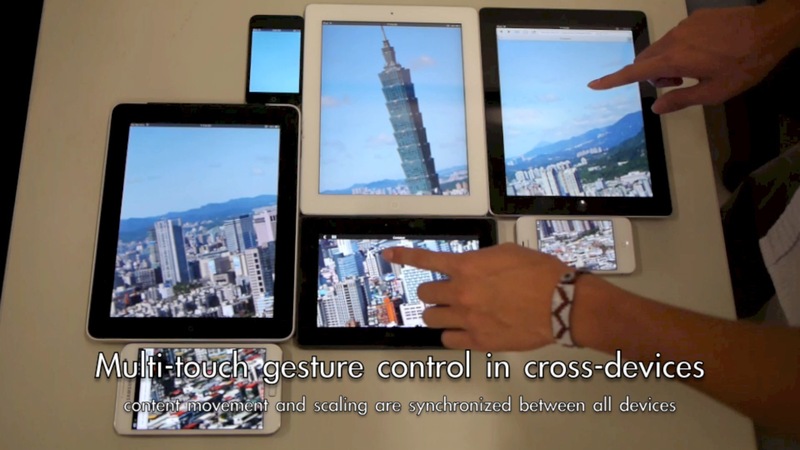 imMatch: Fast Stitching Gestures for Multiple Heterogeneous Multi-touch Surfaces. We present imMatch, a software development kit (SDK) for multiple heterogeneous devices to perform some gestures, to stitch them into one functional multitouch surface. In this research, we proposed several gestures, tried to find a better way to operate the attachment of multiple multitouch displays. Also, we developed a HTML5 software development kit (SDK) which would make it easier to explore the possibility of multiple multitouch display applications. Four gestures were designed and evaluated; Swipe, Pinch, Slide and Circle gestures. Gestures could be used to estimate dot per inch (DPI) of the stitched devices which DPI information is not able to obtain. When devices were stitched, their margins would not able to detect touch events. Seamless gestures were developed to make the cross-devices multi-touch gesture working like one original multi-touch surface. Several applications were developed and introduced to demonstrate the private / public mode switching by using stitching gesture. © Copyright 2013 KO JU-CHUN's Portfolio. Designed by OTOTW.